Dressing - in small bowl, stir margarita mix, oil and vinegar with wire whisk until well blended. Measure 1/4 cup dressing for basting chicken; reserve remaining dressing for serving. Cover and grill chicken over medium heat 15 to 20 minutes, turning and brushing occasionally with 1/4 cup dressing, until juice of chicken is no longer pink when centers of thickest pieces are cut. Cut chicken into slices. 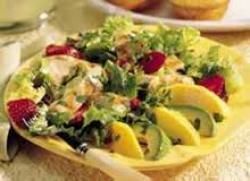 In large bowl, toss salad greens, chicken and strawberries; divide among 4 plates.